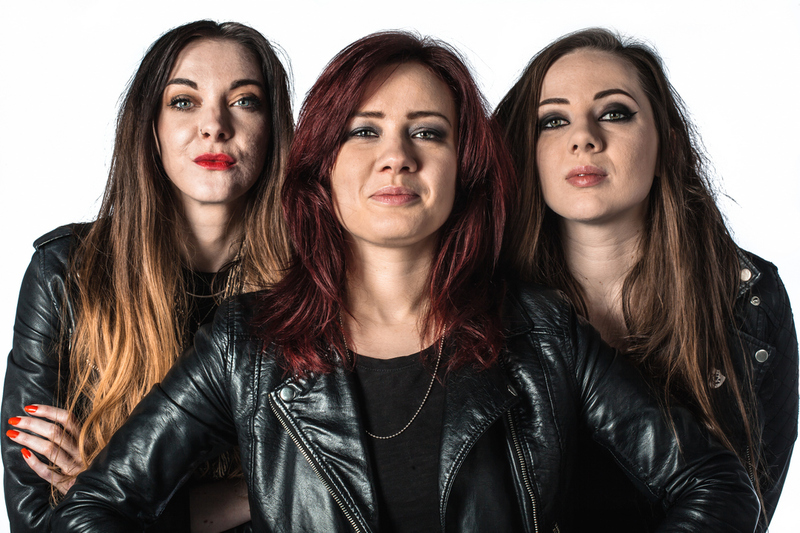 The Scottish hard rock trio The Amorettes are unleashing their fourth album Born To Break. Vocalist/guitarist Gill Montgomery fills us in on the record, touring, the recent passing of a former producer and other topics. Chad Bowar: Was there anything unique about the songwriting process for Born To Break compared to previous albums? Gill Montgomery: I really wanted to shake up my writing style for this album and try new ideas in the time that I had. Ideas like writing the drum and bass parts first seemed to help in terms making me think more about what I was doing with the guitar and vocals. I would also start my writing days with “warm up” songs which would just be throwaway tracks, spending no more than an hour on each, just to get the juices flowing. This was helpful in terms of concentrating on the vibe, and being less precious about final parts. It was fun just to “create” under the pressure. What led you to work with producer Luke Morley again this time? We really love working with Luke, he has a great ear, great style and really understands the band vibe. We loved the work he did on our previous album, White Hot Heat, being able to capture our raw energy in a very stylish way. He knows how to get the best sound out of us, and has stretched us as artists, really helping us define and enhance our sound. Thanks Luke! I think just the studio itself! Being at Rockfield was an incredible experience, and the studio has such a pedigree in itself. Once we got over the initial intimidation and excitement, we just felt right at home. It has such a great atmosphere, beautiful surroundings, and I think it really brought out the best in us. How has the band’s sound evolved from White Hot Heat? There is certainly a more mature sound to this album. We really wanted to focus on pushing our boundaries and mixing in new styles and tempos, without losing that raw rock vibe. It’s always really great when you hear the audience singing your songs back to you at gigs, so it was really a conscious decision to also focus on bigger more accessible choruses. These two things combined mean there is more variety of memorable material. Several songs would have made good album titles. What led you to Born To Break? Born to Break was an obvious choice for me, it really summarized the songs’ messages and contents within one blanket. There are themes of vulnerability, heartbreak and strength, and Born to Break felt right in bringing these all together. How did you come to sign with SPV/Steamhammer? SPV have such a great reputation, and I think we had been on their radar for quite a while. When they heard that we were in a “flexible” position, they made us a great offer, we were very excited! They proposed and we said yes! Does that change your goals and expectations for the album? I think it’s very exciting to have a label based in the heart of Europe. We really hope to spend more time getting out of Britain, and spreading our music further afield. We are confident SPV will be great in helping us spread the word! How was the video shoot for “Everything I Learned I Learned From Rock And Roll”? It was a great day and a really fun shoot. We had a great team behind us, who were so accommodating and did such a fantastic job. Rocking out to the same song 36 times in a row, in front of giant heat lamps, wearing all leather can get very sweaty indeed. The makeup just ran off us! They had to keep troweling it back on. You have a brief UK tour coming up. What else is in the works as far as touring? We have not able to announce any additional tours at this stage, but we are planning to give you some news soon! Please keep your eyes peeled! What has been your most memorable The Amorettes live show? There have been some great ones over the past few years, I think playing Download festival at Castle Donington, England was the best. It literally started pouring with rain as soon as we hit the stage, but no one cared, and the tent was full of people! So memorable in terms of the excitement and crowd reaction! They were amazing! We played an organized gig in the middle of an outdoor shopping center once. We were booked by the local council to promote a summer music festival, but no one had decided to tell the local shops who had called the police on us. It wasn’t the best! There is a lot of time to kill on the road, but we always like to save our energy so nothing too strenuous! We love wandering around the local towns and cities where we play, finding great pubs, vintage shops or noodle bars, we are noodle fiends! What was the response like to last year’s reissue of your debut album? I think fans were generally pleased that we had reissued it. We could see copies of the original going for crazy money on eBay and we just wanted fans to have it at a decent price. It has been nice to hear such great reactions to a piece of our history that we had put together ourselves on a shoestring budget. Chris Tsangarides, who produced your second album, recently passed away. What was your experience working with him on Game On? Chris was such a lovely man. We remember him very fondly, and had such a great time with him recording Game On. We recorded the entire album in just five days, and I remember he kept us so calm when we were all freaking out about the lack of time we had. He had some amazing stories of recording back in the day, with legends like Thin Lizzy, Ozzy and Alex Harvey. We really respected Chris and learned a lot from him. A very wise man. What album would we be surprised to see in your collection? I’m not sure what would surprise you! I have a lot of jazz/soul stuff in my collection, and, while I wouldn’t say I’m a huge fan as such, I find it very interesting to listen to. King Curtis Live at Filmore West is a good go to record when I need some thinking music. There is something great happening in Britain right now, it’s being branded as NWOCR or New Wave of Classic Rock and there is some great music coming through. Great new bands like Tax The Heat have just released their second album, and it’s fantastic. Also, I have been playing a hell of a lot of the new band Wayward Sons. It’s excellent, and I’ve had it on repeat for months!